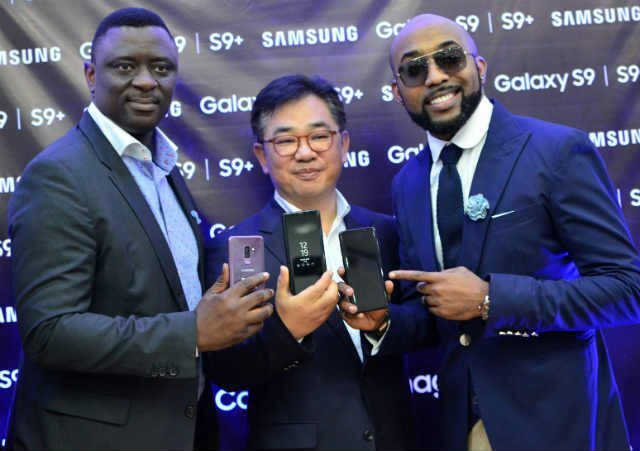 L-R; Director, Information Technology and Mobile, Samsung Electronics West Africa, Mr. Olumide Ojo; President, Samsung Central Africa, Mr. John Park and Samsung Ambassador, Mr. Bankole Wellington (Banky W) during the launch of the Samsung S9 and S9+ smartphones at Samsung Experience Centre, Ikeja City Mall recently. LAGOS, Nigeria –Mar. 23, 2018 – Samsung Electronics Co., Ltd. introduces the Samsung Galaxy S9 and S9+, the smartphones that reimagine the way people communicate, share and experience the world. Made for an age in which consumers increasingly communicate and express themselves more with images, videos and emojis, the Galaxy S9 and S9+ drive innovation with Samsung’s advanced camera. Redesigned with a new Dual Aperture lens that powers an innovative low light camera, Super Slow-mo video capabilities and personalised AR Emoji, the Galaxy S9 and S9+ ensure users do not miss a moment and make their everyday epic. AR Emoji: Samsung lets users create an emoji that looks, sounds and acts like them. AR Emojiuses a data-based machine learning algorithm, which analyses a 2D image of the user and maps out more than 100 facial features to create a 3D model that reflects and imitates expressions, like winks and nods, for true personalisation. AR Emoji shares users’ real-life emotionsnot only in video but also with a range of stickers and uses a standard AGIF file format so users can share their emojis across most third-party messaging platforms. In addition, the Galaxy S9 and S9+ give users peace of mind knowing that their phone is protected by Knox 3.1, Samsung’s latest defense-grade security platform. The Galaxy S9 and S9+ support three different biometric authentication options – iris, fingerprint, and facial recognition – so users can choose the way they want to protect their device and applications. The devices feature Intelligent Scan, a new verification that intelligently uses the collective strength of iris scanning and facial recognition technology to quickly and conveniently unlock a user’s phone in various situations. The Galaxy S9 and S9+ also introduce Dedicated Fingerprint, giving users the option to use a different fingerprint to access Secure Folder than the one used to unlock the phone. The Galaxy S9 and S9+ are available in Nigeria from Friday, March 23rd, 2018 in Midnight Black, Titanium Gray, and Lilac Purple colours. To purchase any of the devices, customers can visit the network providers, MTN, Airtel, Etisalat and GLO; Samsung Experience Stores, and select retail partners nationwide.“Customers are encouraged to purchase their S9 smartphones in Nigeria from authorized dealers so they can enjoy a 24-month warranty,” said Olumide Ojo, Director, Information Technology & Mobile (IM), Samsung Electronics West Africa. The Dual Aperture supports F1.5 mode and F2.4 mode. Dual Aperture is installed on the rear camera (Galaxy S9) and rear wide-camera (Galaxy S9+). Bixby service availability and features may vary by country or carrier. Voice Command recognises English (U.S.), Mandarin Chinese and Korean. Not all accents, dialects and expressions are recognised. Voice command works with a select, growing list of Samsung and third-party apps. See “Apps with Voice” in Bixby for a list of compatible apps.